As promised, here is the recap of my little Bonnaroo trip last week. This will probably end up being a five part series of posts, but I just don't think I could fit it all in one normal-size post. My best friend, Nicole, flew into Alabama on Monday. We promptly assembled a massive grocery list and raided the commissary like we were preparing for doomsday. We then had to cook, prepare, pack, plan, etc. We left for our trip after lunch on Wednesday. 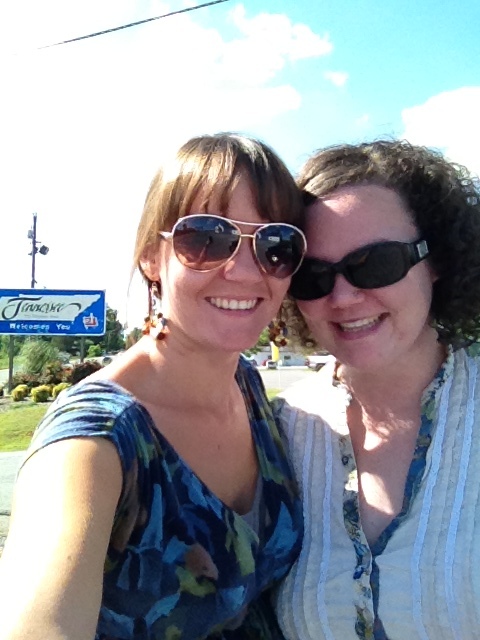 It took about 6 1/2 hours to drive from my house to Manchester, TN. We arrived around 7pm that evening...and here is where the fun begins. 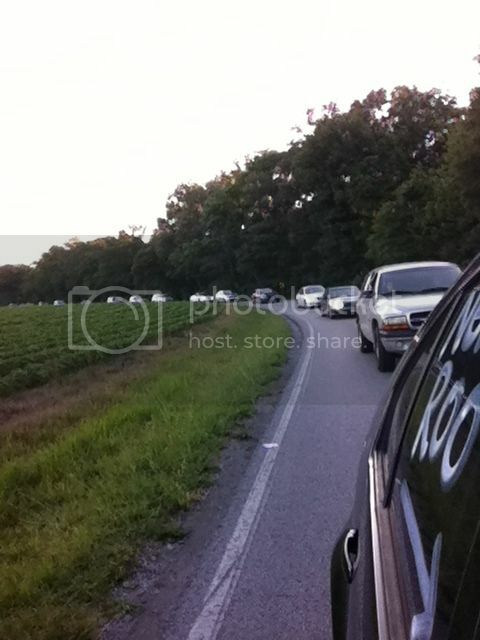 It was no surprise when we found ourselves in an incredibly long line winding through the Tennessee farmland. Honestly, the line was not that bad at all. 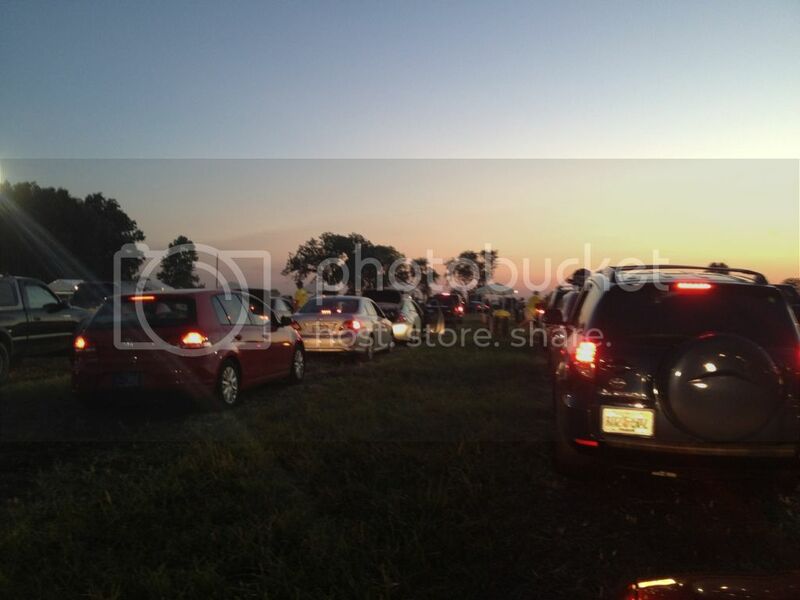 We moved at a small crawl for maybe an hour and a half, which is nothing compared to the horror stories I have heard. Getting through the gates was no sweat. We did not bring anything illegal with us, so they let us right through. Others were not so lucky. It pays to look sweet and innocent, I guess. Once we got through the gate and our wristbands were adhered to our wrists, we were lead in yet another long, slow moving line to the campsite of their choosing. Having NO say in where we would be staying for the next five days was a little frustrating. Especially because they put us in a desolate corner of the campground. Apparently, there is no way to predict or manipulate where they put you. We were able to quickly settle our campsite and introduce ourselves to our new neighbors. 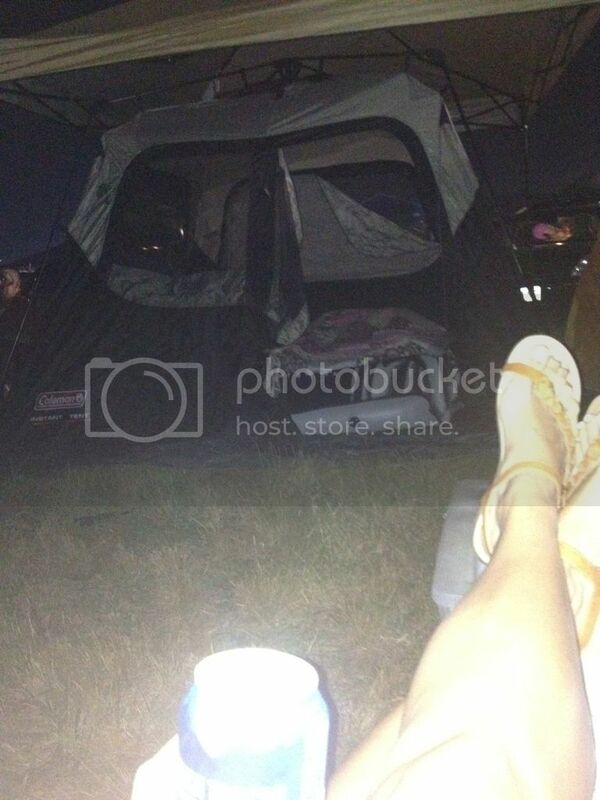 We had a couple beers to unwind and fell asleep to the battle cries of Bonnaroo partiers celebrating the beginning of a weekend of madness. I awoke somewhere between day one and day two to walk a couple hundred feet to the nearest porta-potty. It was somewhere during that walk that I began to wonder what the hell I was doing here. That first night was FREEZING, and I thought there was no way it could warm up to hot anytime soon. To my disbelief, I awoke around 8am to the sensation of roasting in a oven. It was a welcomed feeling after the bitter cold of that night. We got ourselves up, enjoyed some breakfast and planned our day. We headed up to Centeroo after lunch. The walk for us was 30-40 minutes. 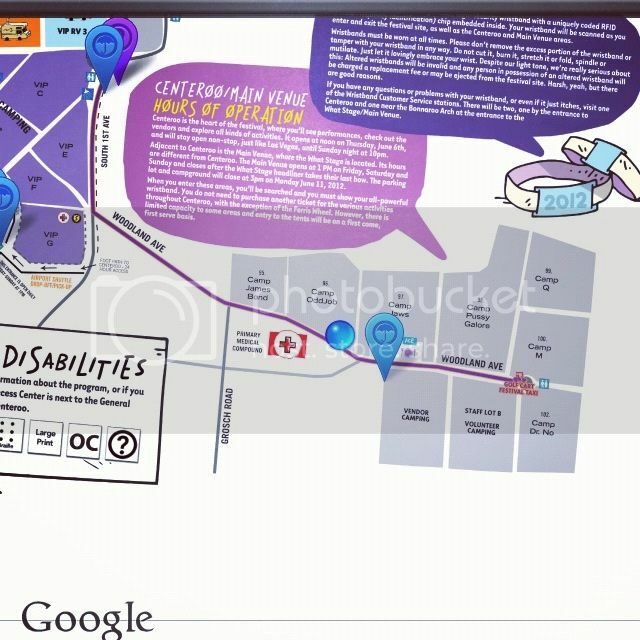 Centeroo is where the main events take place: concerts, vendors, activities, etc. We wandered around, checking out the sights for a while. 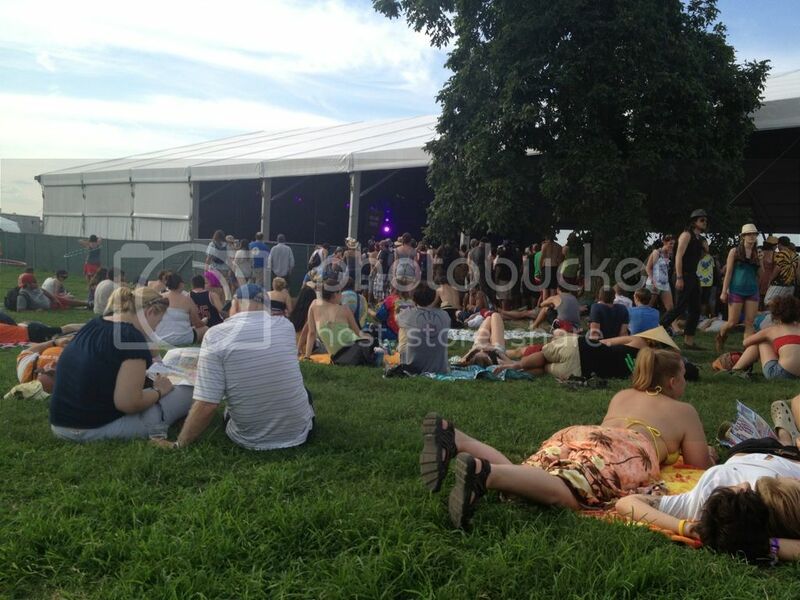 We then found ourselves a nice spot to relax and wait for the first performance of our Bonnaroo adventure. 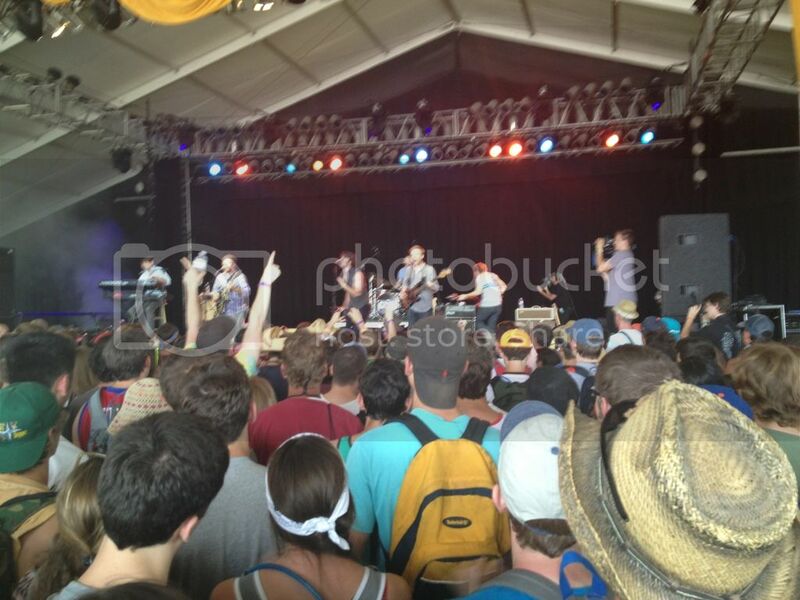 Lucky for me, this performance was The Dirty Guv'nahs. We ended up getting pretty close up for this one. They put on a great show. My only disappointment was that the crowd was a little dull. There was like one guy up front who was obviously a big fan, and I'm not going to lie...I kinda wanted to move my way up to stand by him. (you can see him in the pic with his hands up) I don't understand why/how people can just stand and watch a concert without so much as bobbing their head or tapping their toe. I mean, what's the point? When it's music like this, I'm all over the place, singing and dancing along. The Dirty Guv'nahs were a lot of fun. The lead singer is so charismatic and has loads of energy! They ended their set with Hey Jude, which was surprisingly pleasant...and cruel. I was already dealing with some separation sadness and that was all I needed to jump start the water works. I tried to join the crowd in the na-na-na's but I opted to be a blubbering idiot instead. (In case you don't know, my youngest is Jude and this song has been his anthem since he was in the womb) Oh well, it was still a lot of fun and enjoyable. I highly recommend them if you like southern rock or country. They have a new album coming out this fall and I can't wait for it. After The Dirty Guv'nahs, we headed over to a different tent to listen to a few more new bands. The crowd was already gathered for these bands, so we decided to set up a blanket outside the tent to enjoy the music, watch the hula-hoopers and mingle with new friends. We ended up listening to The Cave Singers, Dale Earnhardt Jr. Jr., and White Denim. From there, we took off to explore the venue some more. It was at this point that we happened upon Silent Disco. We knew about it before, so we knew we couldn't pass it up. Silent Disco is basically a dancing tent that no music emits from. Why? Because the dancers are all wearing headphones with the music playing. From the outside, it looks like a bunch of crazy people dancing and singing to music in their heads. There are special DJ's playing at certain times. We were there when K-Flay was at the table, and she was pretty fantastic. About 15 minutes in, I turned to Nikee and said, "Can we stay in here all weekend?" We seriously, had so much fun. And I'm not a clubber or anything, but I do love to dance. 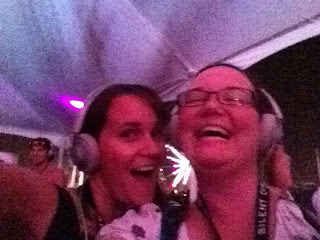 After an hour in Silent Disco, we headed out to go see Alabama Shakes. I was so excited to see this band, so I don't know why I thought I could show up 5 minutes before they went on and get close enough to even hear them properly. The tent was so packed we had to stand so far away that we could hear the people talking around us more than the music. It wasn't the listening experience I wanted so we bailed after I heard them play Hold On. I was bummed that I didn't get to enjoy it more, but it was a learning experience. You have to be early and get close up for the bands you really want to see. Make 2 or 3 bands a priority and relax about the rest. So after a long day, we headed back to camp, ate a late night meal and suited up for another cold night. So far sounds like fun! 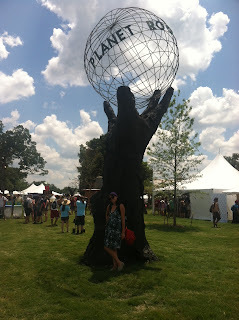 Festivals that are this big really do require a lot of learning and planning. Lucky for you it was several days long. So jealous already and I know there's so much more to come! I laughed so hard about the silent disco tent. I have never heard of this!! 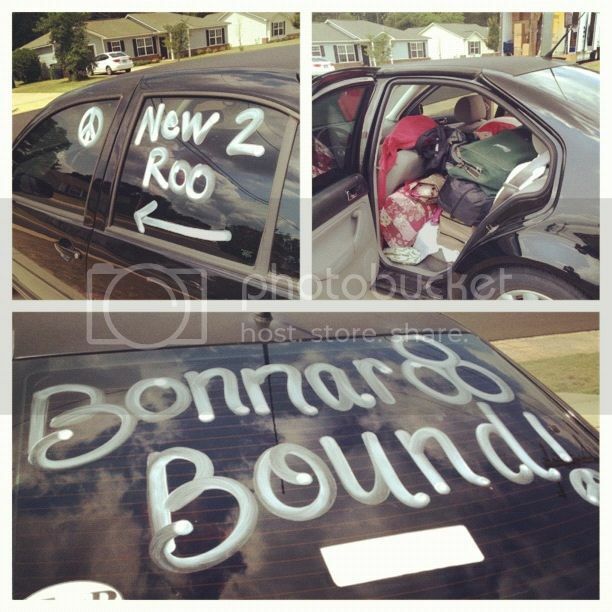 I want to go to Bonnaroo so bad. Anxiously awaiting your next installment!! Cool post! Sounds like a lot of fun! i need the silent disco in my life!